I've taken one cutting from the plant since I potted it. I'll be taking another cutting this afternoon. As you can see, it's not terribly large or bushy. Fortunately, we still have 1 1/2 months of good growing weather. Perhaps it still has time to perform. My first cutting is dried and in a bag in the cupboard. The plan is still to take all my dried stevia and run through my coffee grinder. I was talking with some ladies last week about using stevia. We all seem to agree that it has an aftertaste, if used on it's own. But perhaps when used in a 50/50 blend with table sugar, it will have a better taste. One woman said that she liked stevia in vitamin water-type drinks. So beverages look like one good use for stevia. From what I've read, stevia's sweetness does not break down with heat, making it a better sugar substitute in baking than the yellow, pink or blue packeted sweeteners. In fact, the components in stevia which contain the sweetness are more readily released with heat than cold. So, by filling a tea ball or bag with stevia leaves and immersing in hot water, one can make their own liquid sweetener for uses such as a few drops on fruit compotes/salads, in dressings, and in cold drinks. Interestingly, there appears to be some controversy over the safety of stevia. So far, I have yet to read anything conclusive on this. My thinking is, distilled and processed extracts of stevia may be like anything else. When we tamper with nature too much, we wind up with a form of a food that lacks the original food's inherent health boosting qualities, and has a pronounced amount of it's detrimental effects. The whole leaf has been in use in other cultures for over 1500 years, with no recorded ill-effects. As with everything else, be sensible, use caution where applicable. Until more is widely known about stevia, if pregnant just don't use it. And if not pregnant, don't overdo it, especially in the refined forms, such as those little green packets. We all could do with less processed food items in our diets. This post was not meant to be any sort of medical advice/article or distillation of medical information. These are simply my opinions on what I've read to date. Anyways, my stevia experiment continues. In warmer climates (So. 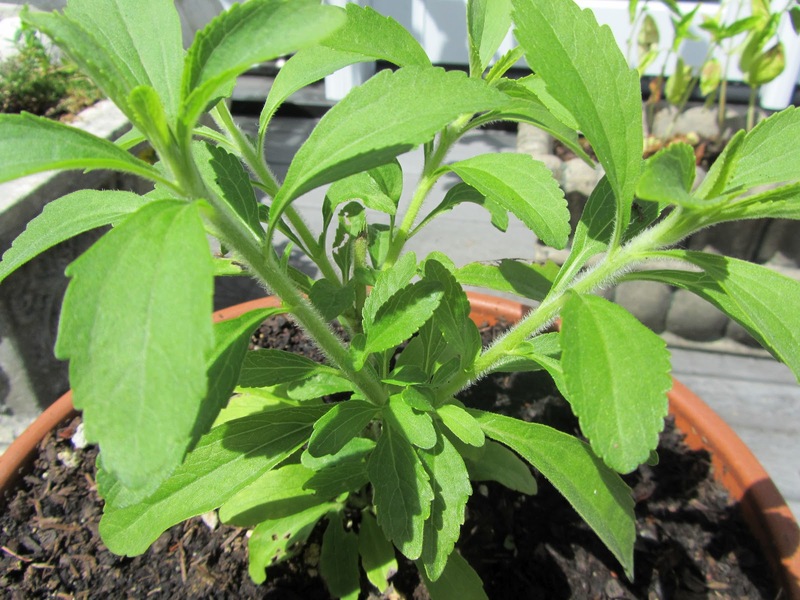 California and Florida), stevia is a perennial. At the end of summer, I plan on both bringing the plant indoors (and hopefully overwintering it in the window), and taking a cutting from it to try and root in water. With luck, next year I won't need to buy another plant. I love that you are taking pro-active measures to using a natural sweetener, Lili! Might I impose upon your good nature to use your post on my blog, or at least portions of it? I am adamant that people need to know WHY they should not use those colored packets; they deserve to know HOW to deal with it, as well. You have done an eloquent job of teaching here. I await your response before I do a thing! God bless you for all the good you do. Of course you may use, quote, link to (don't know what format you had in mind), either of my two posts on growing stevia. I'll tell you about something that happened to me recently, with regards the little blue packets. I was drinking a diet soda (the first one in a while)and my head began to feel funny. Then I became dizzy for several minutes. This has happened before, but I always attributed it to the caffeine. I checked the can to see if it had caffeine, and no caffeine. So when I got home I did a little searching on the internet, and it seems that I am not the only one with a negative response to some artificial sweeteners. Anyways, this is enough to keep me away from blue, pink, and yellow packets. At church now, if I have some tea or coffee at coffee hour, I just use a bit of sugar. I figure a half packet of sugar is far better for me than some chemicals. And if I'm ever some place where beverages are offered, I choose a juice, water, coffee or tea. At least I can pronounce all the ingredients in those drinks! Too little is widely known about a lot of the processed stuff we put into our bodies. We really do have control of what we eat, which ultimately determines our health. I'll add more on what I've learned about stevia in the coming month. 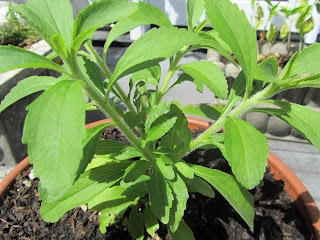 Hi Lili, Last summer I grew quite a bit of stevia and harvested it right before the first frost. Apparently it needs the colder weather to bring out the most sweetening, or so I understand. I hung it in my basement to dry, near the dehumidifier and left it for some time. Later I put it through my coffee grinder but found after trial and error that it takes quite of bit of crumbled, dry leaves in the grinder together at the same time to get the fine powder. And of course it's green too. It's not nearly as sweet as what you can buy in the store but it's still plenty sweet. The whole experiment worked well for me. I usually mix stevia with erythritol or I use it alone. I found that I liked the green stevia in some beverages, but not others. What I liked best was a blend of part sugar, part stevia. I hadn't heard that it sweetens up in the cool weather. That's good to know -- thanks for the information!